Though these 1971 beauties are antique by modern standards, they are the start of a very important part of the Nikon System, the dawning of the day of Electronic Flash. 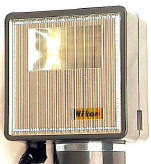 Today Nikon is often thought to have the most advanced 35mm flash system. It was not always so. 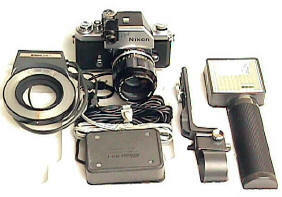 These boxed mint units are Nikon's first Electronic Flash units, the SB-1 and its companion ring flash. The SB-1 is a professional power potato masher, with a guide number of 119 in feet, or 36 in meters. It came with a flash extension arm that looks like it was designed by a battleship designer, complete with quick release if you needed to use it for a boat anchor. Designed with incredible versatility, this unit will flash anyplace you point it. Zoom, rotating and bounce flash heads were FAR in the future, not automatic exposure and TTL flash. The SB-1 had the amazing flash choices of ON and OFF, and Test. You then manually calculated the desired f/stop based upon the distance with the dial on the back of the flash, and manually changed your f/stop accordingly. Every time you focused at a different distance, you got to do it all over again. For some reason the flash head has a terminal on it's side, as well as on the underneath side. Designed for the busy pro, the SB-1 could deliver 80 brilliant flashes on its rechargeable Nicad, before you recharged the battery for FIFTEEN HOURS. 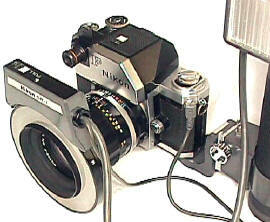 The SR-1 may have been the first production Ringlight by a Japanese camera manufacturer. 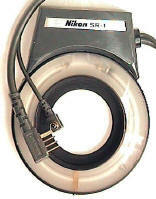 The Ringlight plugs into the SB-1 for its power. 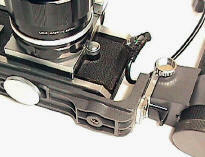 It attaches to the lens with a screw in 52mm filter adapter, the standard filter size for most Nikon lenses at the time. Nikon's future flash system design brilliance was foreshadowed with the incredibly futuristic FULL and ONE QUARTER power switches. What will they think of next? ?